A fire in the canteen, a nasty break-in at the office, or flooding in the stock room… Unfortunately, bad things happen to good businesses. And when they do, it’s quite likely that you’ll need to shut down your money-maker to manage the crisis. When a business closes down completely, existing and potential clients alike have no other choice than to turn to competitors. Hey, it’s nothing personal. It’s just business. We’re not being overly dramatic when we say that in today’s competitive economy, even the slightest interruption can have devastating effects on your business. Let’s look at how the right insurance can help you close your doors for just a short time, and save you from closing your doors for good. This type of cover is sometimes referred to as ‘business income insurance’, but in our kingdom it’s just plain ol’ business interruption insurance. To cut a long insurance story short, this policy compensates you for loss of income when your company has to shut down completely due to damage covered by the king. A good example is a bakery insured by our royal business cover. The baker’s kitchen was reduced to ash and smoke after a fire broke out during the night. Now, a bakery is somewhat (to put it mildly) limited without its kitchen. So naturally they had to close down while the king issued orders to fix and replace everything. During this time, no income was generated… And yet, there were still bills to pay. The suppliers’ invoices, salaries, rent and electricity still had to be covered. Without business interruption insurance, the baker might not have survived the financial implications business’ face after a fire. Luckily, the baker was backed by the king’s royal service! 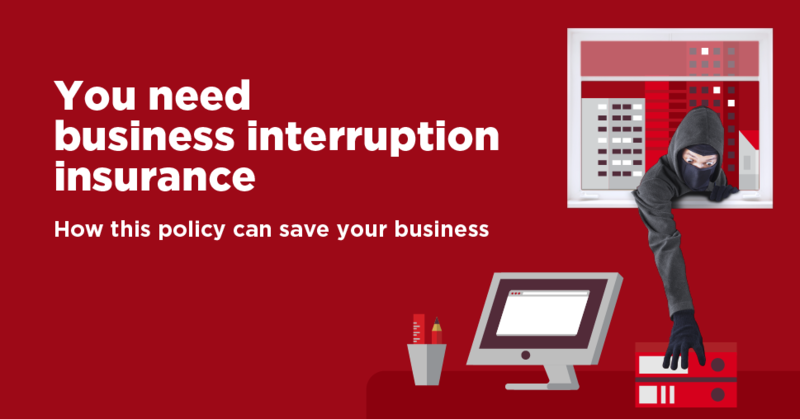 Ultimately, business interruption insurance should form part of your business’ survival and continuity strategy (the part of your plan where you consider how to continue paying your fixed expenses or possibly even continuing with your business operations even when there’s been a fire). Let the king and his team of business insurance experts work with you and your broker to create a customised business insurance policy that includes cover for the things you never expect to go wrong. Together, we’ll help you save with super affordable premiums, help you avoid underinsuring your potential business empire, and advise you against paying for cover that you simply don’t need. And when we say ‘together’, we truly mean it. We won’t do anything without first dealing with your broker. This way, we can keep things transparent, fair, and in both our interests. If you don’t have a broker, then we’ll connect you with 1 who is best suited to your type of business. Get a quote and give your business our royal touch today!